See our 2019 Community Cleanup Calendar on this page to find out when your neighborhood will host an event, what items they accept and cost per load. 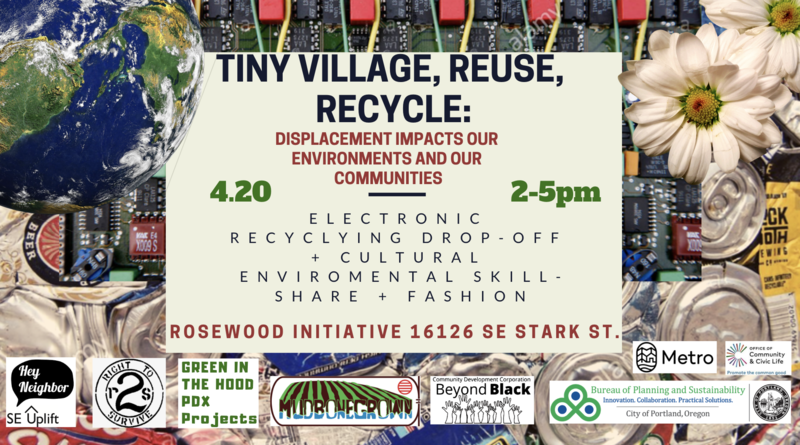 Trash Bash, Haul-Away, Collection Event, Cleanup – whatever you call your event, this is your one-stop-shop for helping neighbors get rid of bulky items like old vacuum cleaners, mattresses, furniture, scrap wood, empty paint cans and cat castles upholstered in blue carpet taking up valuable space in their homes. 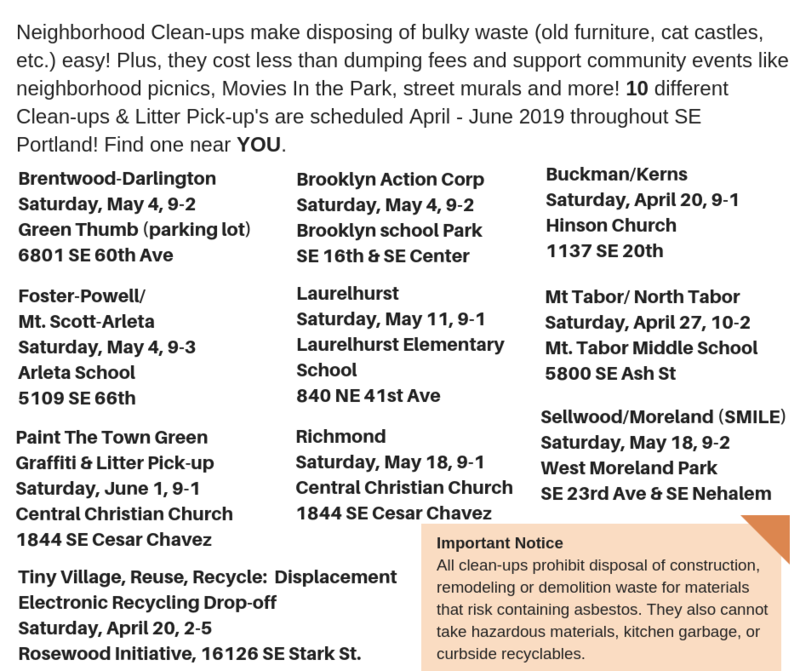 Costs associated with Neighborhood Cleanups vary location to location, but are always less than fees required at the dump and help to fund neighborhood projects and activities like picnics, movie nights and more. 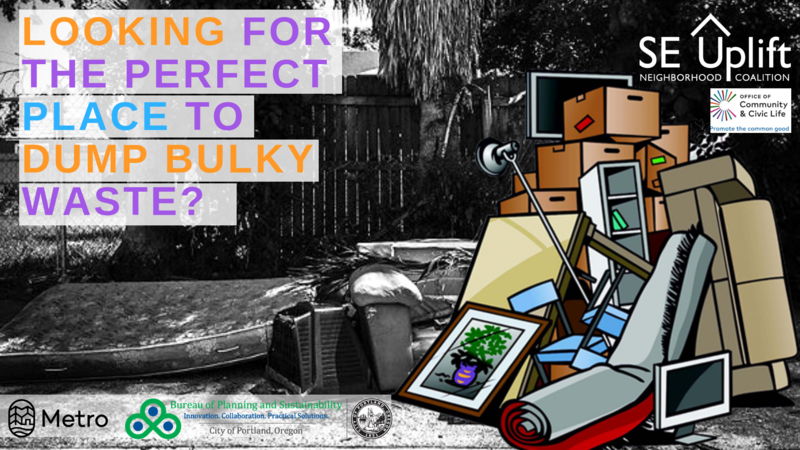 Neighborhood Cleanups also encourage recycling and reuse as an alternative to throwing things in the dumpster headed for the landfill. 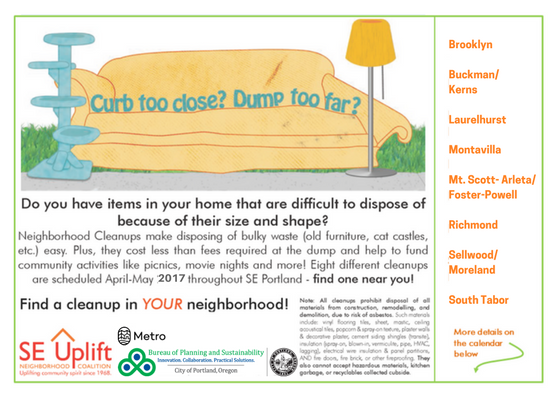 Below you will find our up-to-date cleanup calendar as well as resources for volunteers who want to host their own neighborhood cleanup. 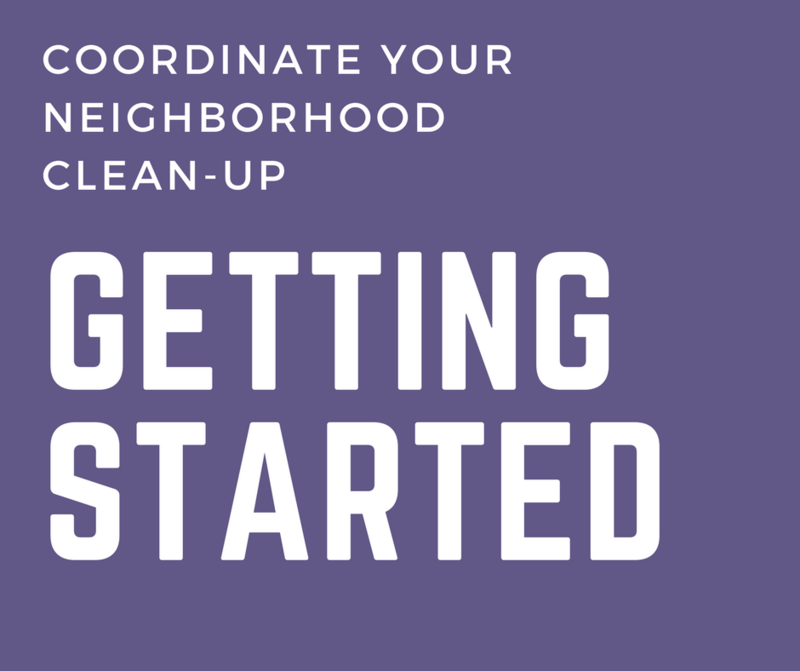 Want to plan a neighborhood cleanup, but aren’t sure where to begin? SE Uplift provides staff support and makes sure that you have what you need right from the get go. We can help you get you off on the right foot with our “Getting Started” tutorial linked in the image above. 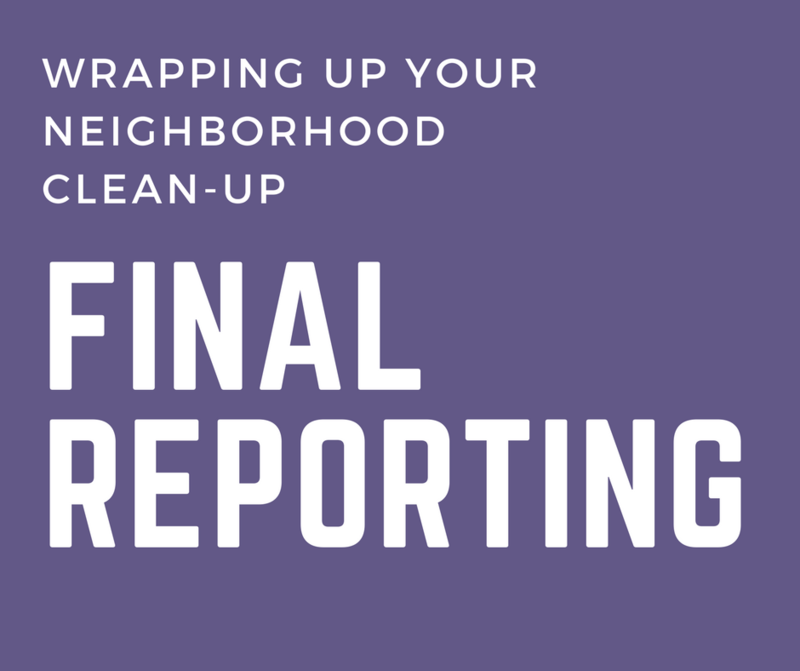 Find the nitty-gritty details of what you’ll need to track for your final reporting process in our “Final Reporting” tutorial linked in the image above. We recommend taking a look while you’re still getting started to help ensure that your event runs smoothly! Looking for the right hauler? Want to recycle more? How about a comprehensive guide that will walk you through all of the necessary steps needed to run a smooth and successful event? 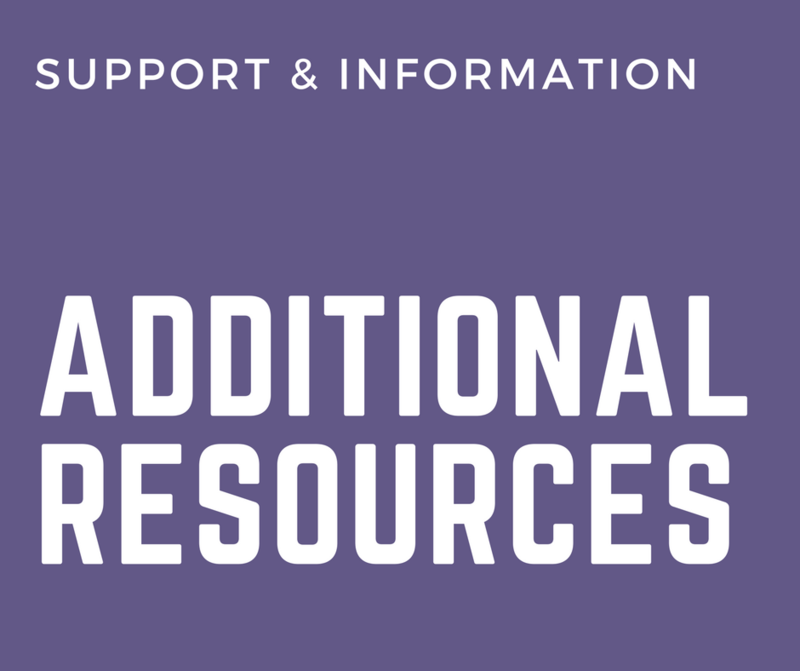 Check out the link above titled “Additional Resources”! Give credit, where credit is due! 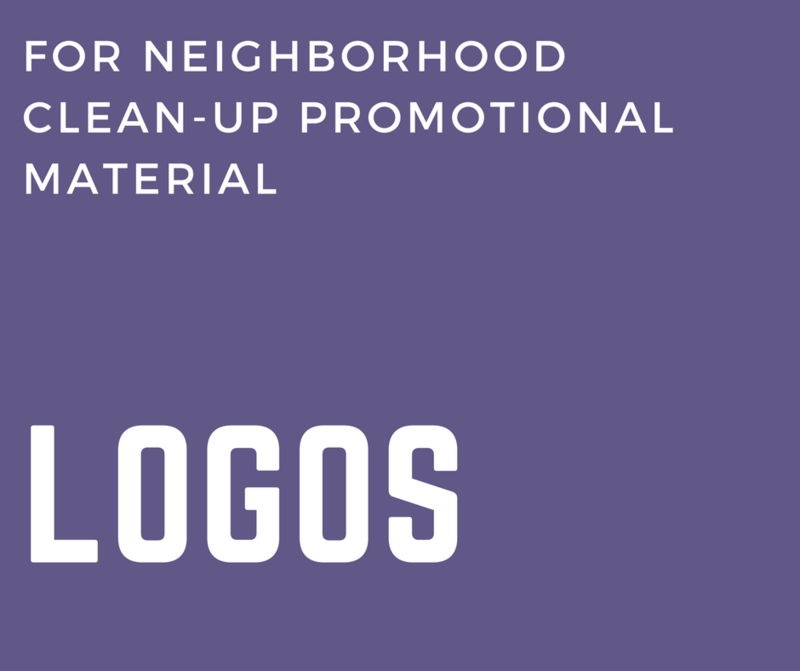 Find all the logos you will need for cleanup materials in the linked image above.